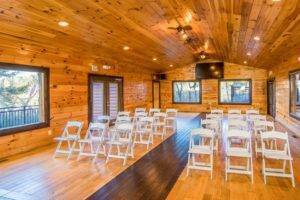 Moose Hollow Lodge is a 9 bedroom cabin with room for up to 56 guests! Renting our massive lodge means that your entire group will be able to stay under one roof. Having the whole team in one place makes coordinating transport, meals, and virtually every other facet of your vacation very convenient. Unlike a hotel, where everyone is confined to their separate rooms, Moose Hollow Lodge offers lots of common areas for guests to gather. Who knows what great ideas could arise from a discussion in the living room or a group conversation around the dining room table? center includes seating for over 60 people, six 60″ round tables, and six 6 foot rectangular tables. Making presentations is a breeze, as the conference center features an 80 inch LED TV that you can hook up to your laptop. Guests will also find four microphones for lectures and speeches. For convenient dining options during your conference, you can take advantage of our catering service. Moose Hollow Lodge has partnered with Fruitful Vintage to provide a variety of delicious meal packages. 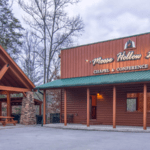 Renting Moose Hollow Lodge is one of the most cost effective ways to stay in Pigeon Forge for a business trip. When compared to reserving dozens of individual hotel rooms for everyone in your group, the total cost of renting our large cabin is much lower. Also, staying at Moose Hollow Lodge makes it easy to save money on meals. Unlike hotels, our cabin provides a fully furnished kitchen, so you can easily prepare dinner for your whole team. Eating out with thirty to fifty people can be very expensive, so having the chance to dine in at your cabin can do a lot to keep your trip under budget. The Pigeon Forge area offers a number of great team building opportunities that your group will love. Popular activities including white water rafting, horseback riding, ziplining, ropes courses, indoor skydiving, hypnotist shows, and many more fun things to do as a group. 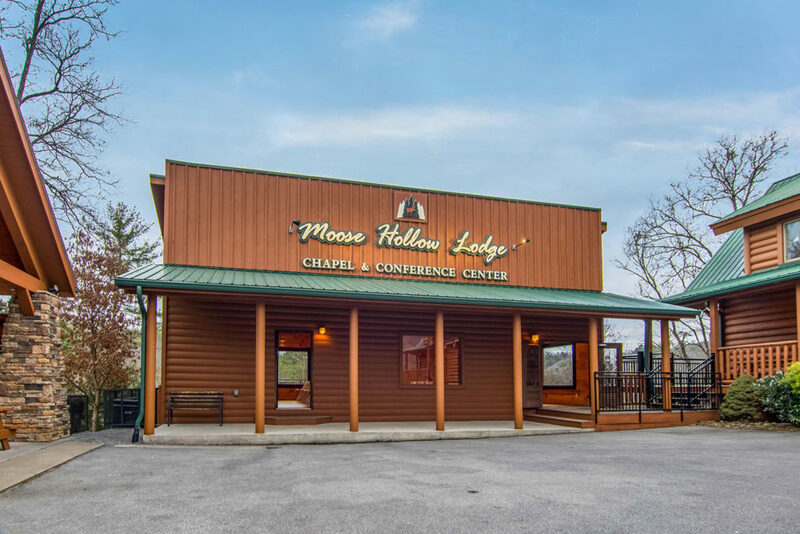 To start planning your business retreat in the Smokies, take a virtual tour of Moose Hollow Lodge! The cabin truly was perfect. The location was perfect. The cabin had everything you could ask for. We had 3 generations of family with us and everyone had a great time. Our 2 puppies even had a great time! We ended up spending more time at the cabin than we did exploring Pigeon Forge. The description and pictures that Eddie uses to describe his cabin are exactly 100% accurate. We have zero complaints and we plan to book again. Thank you Eddie for allowing us to rent your cabin. We had a great time!